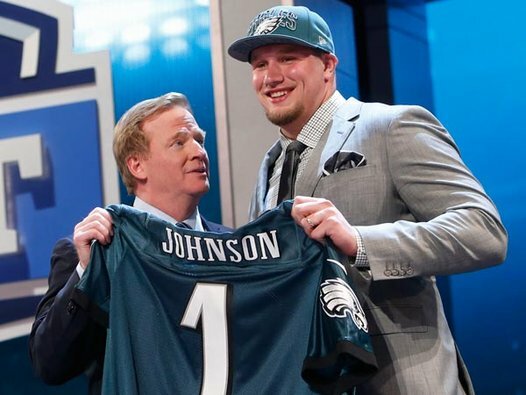 1st round: OT Lane Johnson – The Eagles solidified their offensive line by taking Lane Johnson, a supremely athletic tackle who can play on either the right or left side. He’s new to the position and is only scratching the surface of his potential, but is more than a project. He was one of the more impressive players at the Senior Bowl and should win the right tackle job. A starting offensive line of Jason Peters, Evan Mathis, Jason Kelce, Todd Herremans, and Lane Johnson is one Eagles fans should be excited about. They could be the key to success for Chip Kelly, who relies on the running game. 2nd round: TE Zach Ertz – Chip Kelly loves athletic tight ends because they force defenses to choose whether to stay in their base defensive package or put an extra defensive back on the field. After Ertz carved up his Oregon Ducks last year, many insiders believed that Ertz was the top tight end on the Eagles’ board. The Eagles certainly have bigger needs than another skill position player, but Chip Kelly decided he had to have another weapon at his disposal. Ertz has a big frame, soft hands, and smoothness as a route runner. He can line up as an inline tight end or as a flex player in the slot or out wide. With Brent Celek and James Casey both locked up long-term, it’s hard to figure who the odd man out is. There are now too many mouths to feed at tight end, and Chip Kelly can’t justify paying all of them so highly or investing such high draft picks in the position. 3rd round: DE Bennie Logan – The Eagles needed defensive help in this draft, and although they waited until the third round to get it, Bennie Logan should contribute immediately. Entering draft weekend, the Eagles were paper thin along the defensive line, and Logan can earn a healthy snap count in his rookie season. He was a reason why the LSU defensive line was so dominant over the last few seasons because he plays the run very well. He fits nicely as a 3-4 defensive end because he likes to stack and shed blockers more than he looks to penetrate and get up the field. LSU recognized him as a high character individual by awarding him with their storied #18 jersey for the 2012 season. 4th round: QB Matt Barkley – The shocker of the draft was Matt Barkley, who could be considered the antithesis of an Oregon Duck quarterback. As it turns out, there is no prototypical Chip Kelly quarterback, and the Eagles definitely identified Barkley as their guy because they traded up to get him. He’s a traditional dropback passer with limited athleticism. Although he has been criticized for a perceived lack of arm strength, he has good enough arm talent to succeed as an NFL quarterback. He’s widely regarded as a great leader who works hard and cares about winning. He’s a four year starter and should be considered the favorite to win the backup job over Nick Foles. The Eagles are still without a long-term solution at the quarterback position, and Barkley was well worth a roll of the dice in the fourth round. 5th round: S Earl Wolff – Wolff will provide competition for a secondary that needs it. A high-character individual with great speed, Wolff fits best as a free safety with the Eagles, but can also contribute as a strong safety and on special teams. His slow diagnostic skills will hold him back, but he’s physically gifted and was productive in college. He bolsters the Eagles’ depth on the back end. He must become a more reliable tackler and find a way to improve his instincts. 7th round: DE Joe Kruger – Kruger could prove to be a huge steal in the seventh round. The 6’6″, 269 Utah product has a big frame and a lot of natural strength and athleticism. He will be a 3-4 defensive end with room to grow. He plays with power and energy, as he is able to anchor against the run and push the pocket to get to the quarterback. He has NFL bloodlines and looks bigger than his Combine weight (many players drop weight before the Combine in hopes of running faster). Not only should he make the team at a position of weakness for the Eagles, but he has a chance to carve out a meaningful role as a rookie. 7th round: CB Jordan Poyer – The Eagles continued their run of defensive players by adding a great value pick in Jordan Poyer. Once considered a second round prospect, Poyer fell in the draft due to poor timed speed and average athleticism. He’s one of the best zone corners in this draft, though, and flashes a tremendously high football I.Q. He has enough length to stick as a boundary corner, but has the instincts and physicality to play over the slot as well. If he can compete with NFL receivers physically, he could take over as the Eagles’ fourth corner and add depth, versatility, and intelligence to the defense. 7th round: DE David King – King was highly recruited out of high school, but never found a home in Oklahoma’s 4-3 defense. He has a good frame for a 3-4 defensive end at 6’5″, 286, and should challenge for a roster spot. With such limited production at the college level, though, it’s hard to envision him making much of an impact in his rookie season. Overall: The Eagles did a good job filling their key needs in the trenches, identified a potential quarterback of the future, and added some nice depth pieces. The only picks I take issue with are the Zach Ertz and Earl Wolff selections. Ertz has starter ability, but I just don’t see where he fits in. On the other hand, the issue with Wolff is talent. I don’t see him panning out into a quality NFL player, and he may not even make the team. As a collective group, Chip Kelly’s first draft class is balanced and talented. wonder what the percentage of plays we will see celek and ertz lined up at TE with james casey at FB. that sounds like a lot of fun to watch. Don’t expect anybody to line up at fullback. My guess is that Casey will almost always be on the field as a flex player/slot receiver. Brent Celek will take snaps as an in-line tight end, and Ertz will enter the game when Kelly wants two movable pieces at tight end. I expect a ton of 2 tight end sets, but I doubt all 3 will be on the field at the same time.